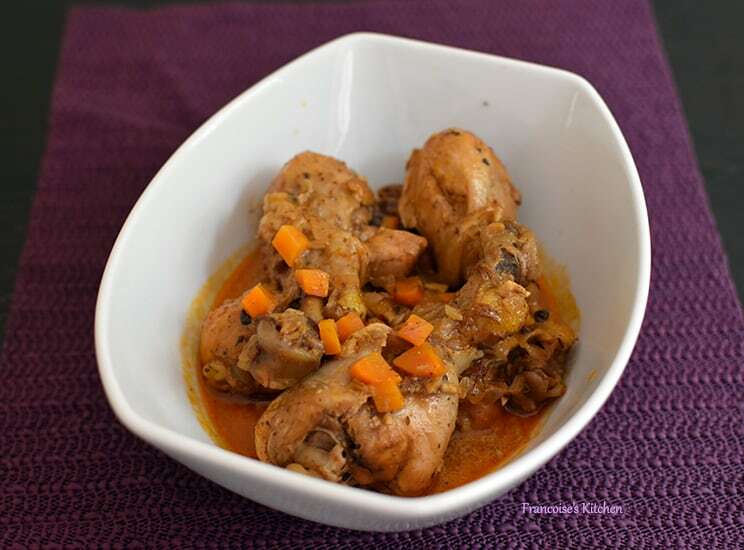 Chicken in Vinegar cooked with a pressure cooker is a rustic French dish really easy to make and perfect for a dinner during a busy week. The vinegar gives a tangy taste and the cream a nice velvety texture to the sauce which my family enjoys with rice and steamed green beans or peas on the side. Peel the onion, cloves of garlic, and carrots. Cut them finely with a knife. Sprinkle each piece of chicken with salt and pepper. In the pressure cooker, put the olive oil and butter. When melted and hot, lightly brown the pieces of chicken in all faces. I make this in two batches. Put all the brown chicken pieces aside. Throw the fat away. Add the onion, garlic, and carrots. Add just a little bit of olive oil if needed so this does not burn. When it is almost soft, add vinegar and scrape the bottom to lift and incorporate all the browned bits. Let it reduce at high heat for approximately 5 min. Add the tomato paste and 150 ml water. Add the chicken. Close the pressure cooker, and cook on high. When the steam escapes, turn down the heat. Cook 20 minutes. Open the pressure cooker and remove all the pieces of chicken. Keep warm aside. Add the mustard and crème fraîche to the sauce. Add pepper and let the sauce thicken a little bit. Serve with rice and green beans or peas on the side if you like.